Nature pet foods are made according to exclusive recipes that provide a complete, balanced diet. 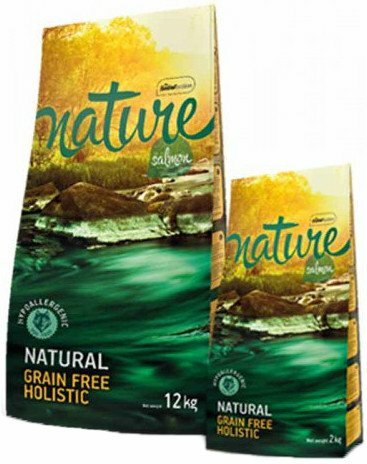 They are prepared with top-quality natural ingredients selected for their low allergenic capacity (a quick search suggests going for “effects” rather than “capacity”). The result is a highly palatable, easily digestible food that will make your pet healthy and happy. Allergens cause antibodies and histamine to be released in amounts that can eventually cause skin disorders, stomach ailments and food hypersensitivities. A hypoallergenic diet improves digestion and prevents the occurrence of other types of ailments. Salmon is especially rich in omega-3 fatty acids (which reduce cholesterol levels) and in digestible protein. It also contains magnesium, potassium, zinc, vitamin A, B-complex vitamins and vitamin D and it is noteworthy for its high digestibility (94%) and as an important source of calcium. It has beneficial effects on the skin and considerably reduces the possibility of food allergies. Ingredients: Fresh salmon (40%), potatoes (22%), dehydrated salmon (20%), potato protein, salmon oil, salmon hydrolysate, beet pulp, inulin (FOS), mannas-oligosaccharides (MOS), glucosamine (0.05%), chondroitin sulphate (0.03%), ginger, carrot, apple, seaweed, flaxseed, rosemary, thyme, yucca extract, L-carnitine, vitamins and minerals. Nutritional additives: Vitamin A 20,000 IU/kg. Vitamin D3 2,000 IU/kg. Vitamin E 600 mg/kg. Vitamin C 300 mg/kg. Iron (ferrous sulphate monohydrate) 75 mg/kg. Iodine (potassium iodide) 3.5 mg/kg. Copper (cupric sulphate pentahydrate) 10 mg/kg. Manganese (manganese sulphate monohydrate) 7.5 mg/kg. Zinc (zinc oxide) 150 mg/kg. Selenium (sodium selenite) 0.2 mg/kg. Taurine 998 mg/Kg. Carnitine 100 mg/Kg. Preservatives and natural antioxidants rich in tocopherols.